When you need specialist inspection, maintenance and repair to structures or in confined spaces… PMP has unrivalled experience in providing surveying, maintenance and engineering services in hostile environments. Why scaffold when PMP can carry out the work by rope access? 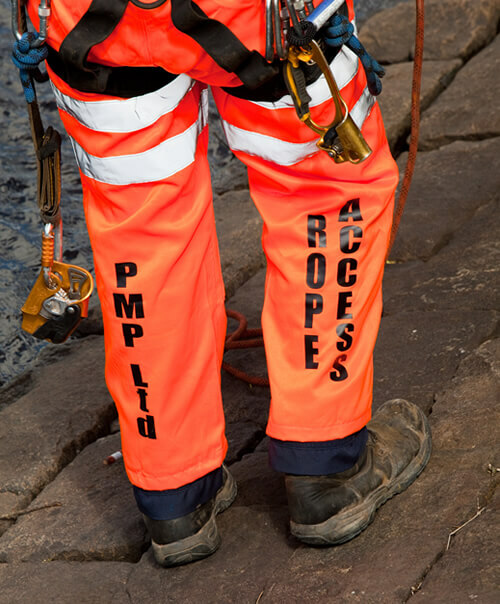 At PMP, our industrial IRATA rope access services use climbing and abseiling techniques to provide cost effective access to areas which would otherwise be inaccessible, impractical, unsafe or too costly by conventional scaffolding or access platforms. When using rope access you have two points of contact at all times to ensure that, in the unlikely event of failure in the primary rope, there is an independent back up. PMP rope access surveyors and engineers can carry out inspections, surveys, and engineering tasks of repair, refurbishment, alteration or replacement from ropes. Physical inspection, including in high risk confined spaces, offers many advantages when compared with remote surveys. Sometimes remote inspections just do not provide the level of detailed information required by engineers for decision making. We provide qualified, independent assessments, reports and interpretation leading to comprehensive and appropriate recommendations. All reports are backed by photographic evidence. One of the main requirements of industrial rope access training is that all operatives are capable of carrying out rescues from work at height, a requirement of the Working at Height Regulations 2005. PMP offers a wide range of inspections, surveys and condition assessments using the most appropriate measuring, inspection, non-destructive testing and communications equipment. PMP’s surveyors and inspectors make condition assessments by accessing the affected area in order to view defects close up and assess the consequential damage.